Include info for personalization. If you run out of space, include it in the "notes to seller" when you check out. You can purchase it as a printable file (to print on your own), or you can purchase printed cards from me. Scroll down to find out more! If you're printing on your own, a matching back side is $10: http://etsy.me/XeDsZc If I print these for you, the matching back side design is included. 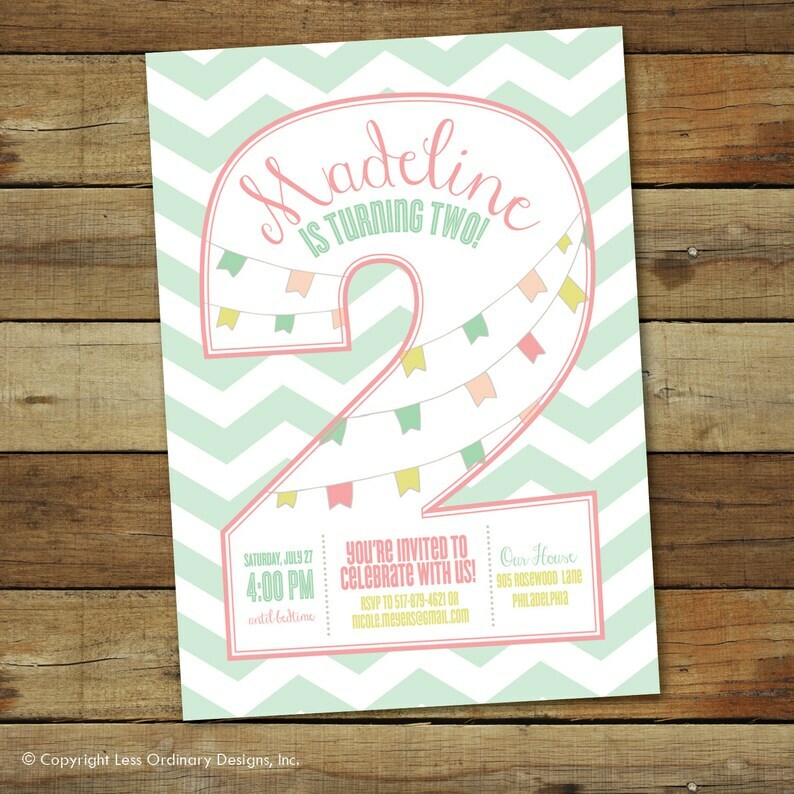 Matching party printables are available upon request. Contact me for more information. Your order will be customized by me and a digital proof will be emailed to the email address on your Etsy account. Proofs normally arrive in 24 hours or less, but please read the FAQ at the bottom of the page for current first proof turnaround time. If applicable, PHOTOS can be emailed to me at sara [!at] saralukecreative.com. After you review and approve the proof, you may use the high resolution file to print as many as you need at home, photo center, local print shop (Office Max, Staples, etc.) OR order my printing service (which offers FREE OVERNIGHT SHIPPING). To choose a print package, click on the “type of card” dropdown on the listing. Printed card packages include envelopes and OVERNIGHT SHIPPING IS FREE! To choose a print package, click on the “type of card” dropdown on the listing and choose your desired quantity. ▶ Once a proof is approved, printing takes 1 – 2 days, and then cards are overnighted via UPS. ▶ Folded cards and ornate shapes are available (contact me for pricing). © Copyright Less Ordinary Designs, Inc. Please do not copy. Very cute design and perfect for our event. The seller had a proof to me later the same day of my purchase, and made an edit within 24 hours as well. They printed great (only very slightly different colors in person on the screen compared to when I printed them through FedEx Office, but not a significant difference). Would use this shop again! How long does it take to receive a proof? Turn around for a digital proof is normally 24 hours or less (sometimes a little longer over the weekend). For current turn around times, please see my shop announcement. Are your items digital or printed? Print packages are available and you can see those options in the "type of card" drop down on each listing. My printed cards will be shipped directly to you. Printing takes 1 - 2 business days from the time you approve the proof and then they are OVERNIGHTED to you. Printed cards, merchandise & envelopes will automatically be sent to the shipping address listed on your account. Who is responsible for proofreading? I ask you to approve and double check the proofs that I send. If a proof is approved with a spelling error or date error, or you have requested the wrong size, less ordinary designs cannot be held responsible. Please print a sample of your card before having ALL of them printed or giving the ok to print. I can't be responsible for another printer's print quality. Do you offer refunds on digital files? Because payment is for my work only, I cannot offer a refund design fees once a proof has been started. Even if the proof has not been approved, I've already done the work for which I've been paid, so a refund isn't possible. Do you sell Photoshop Templates? I do not currently sell templates. If you purchase a design requiring customization, you will need to provide details for that design (using the link provided in your confirmation email from etsy) and wait for it to be customized. I do not sell templates. Refunds will not be given to those who were hoping to buy a template. I do not design in Photogshop and I do not sell templates. In what format are files provided? All of my digital files are provided in .jpg or .pdf formats. Please see each item description for clarification. I do not design in Photoshop and do not provide Photoshop templates. I do have samples of my card stock available. Just ask! Are my photos okay to use? Photos should be 300 dpi or higher for proper print quality. Less Ordinary Designs cannot be held responsible for photo quality. If I see a photo come through with low resolution, I will let you know. I will fully uphold the legal rights of photographers. It is illegal for me to use images that are copyrighted without the permission of the photography or company that holds the copyright. By submitting me photos, you agree that you are the photographer or have permission in the form of a copyright license from the copyright holder. You also agree to take full responsibility for any misuse of copyrighted images and agree to not hold me liable for any misuse of copyrighted images. Because I work from my home with four small children, I cannot do business over the phone. BUT, I am very quick to respond to email and convos!